Our shop in Modesto uses the latest diagnostic technology to get your truck on the road safely and quickly. Whatever your truck parts or repair needs, look no further than A & B Truck Repair, get in touch with us today! 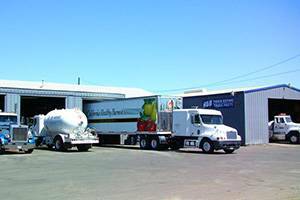 A & B Truck Repair, is an all makes independent truck repair and parts facility, family owned and operated for over 40 years. Our business success is based on quality work, customer satisfaction as well as quality employees. Many of our customers have been with us for over 30 years, a few for 40+. Our customers range from single truck/bus/tractor and RV owners to nationwide fleets who have come to count on us for all types of truck repair. Most of our employees have been with us for over 15 years and form quaility working relationships with our customers, allowing us to offer a consistent high level of service for truck repairs. Starting as a truck repair only facility capable of handling anything from minor electrical to complete overhauls of all drivetrain components. We've since added a complete all makes parts department which includes parts from drivetrain to chrome accessories. We look forward to the opportunity of earning your business and showing you why our customers keep coming back!